There was a time when companies could survive without having an online presence. Now, the world is becoming digitalized with every passing day. With such digitalization comes the need to tap into the online market. Unless you wish to be left behind, you must access your consumers through online mediums. This is the best and most cost-effective way to reach out to millions. One thing you will need for this is a website. Now, you have two choices. Either you can choose to create a website from scratch or get a website developer to help you out. In both cases, you will first need to get your hands on a domain name. For this, you will require a web hosting service. There are quite a few in the market. We assessed each of them on the basis of their offers and promotions. 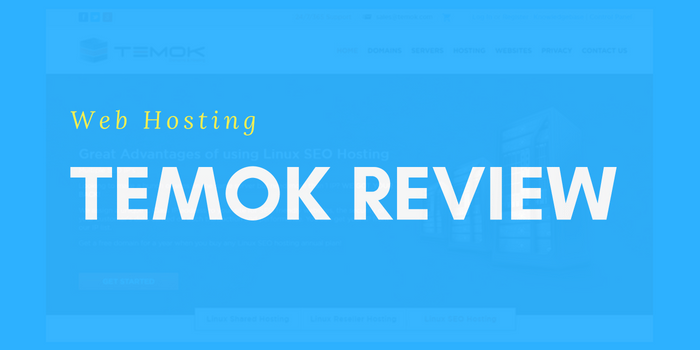 One IT service that stood out for the right reasons was Temok. This IT service was formed back in 2014 and since has gathered quite a lot of clients. Currently, it boasts a whooping portfolio of 8000 plus clients, which showcase the quality of the services provided. The company is made of a team of people, each belonging to different fields. For instance, they have developers, marketing specialists, and design professionals. Together, they are able to deliver a holistic package. Domain Registration: Here, bulk domains, as well as international domains, are offered. The prices of each domain name differ. Different extensions are offered, which include .com, .co, .net, .network, .reviews and .services etc. This allows you to personalize your domain name completely. You are free to choose an extension that best fits your niche. Such an extensive collection is unheard of in most web hosting companies. Dedicated Servers: You can also lease your own servers. As mentioned above, the list of countries for a server is quite huge and hence satisfactory. Temok delivers a server package which is equipped with various features. Firstly, it delivers lifetime hardware guarantee. Secondly, you get free reboots and OS installs with the package. Finally, technical support is offered throughout the day to ensure that your queries are heard. Hosting: Various Shared Hosting plans are offered by TEMOK. You can choose one based on your need. Even for the starter pack, you get a lot of services. For instance, you will get unlimited email accounts, spam eliminator service, and SSH support for free. Website development: Here the designers and developers at Temok deliver quite a lot. You can get your logo designed as well as your website developed. For those of you who want to take it up a notch, app development is also offered. You might wonder, why did we choose Temok among the various other IT services. There are two main reasons for our decision. When you are starting your own website, costs tend to pile up. Contrary to popular belief, making your own website is hard. After all, from getting your domain name to actually develop the website, everything costs money. This is why affordability is important. Temok has been successful in delivering affordable packages. There are different packages. Some for starters and some for professionals. The starter package of the shared hosting plan features a promo. By using the coupon “SHARED50p”, your first invoice will have half the fee. The starter plan also includes 50 Gb of disk space, an uptime guarantee, and unlimited monthly bandwidth. The price starts at $2.49 and increases depending on the services you opt for. There are three website design packages. This includes a basic, a start-up and business website. The services included in each differ which account for the differences in price. The basic package is the cheapest while the business package is most expensive. Using the promo, you will get 50% off on the first-month fee. Again, there are different VPS and Reseller Hosting plans offered by Temok. Which is perfect for you depends on what level your business is at currently. Regardless of which you choose, Temok offers a 30% Discount on the first subscription fee. Between the promotions, the array of services and the various packages, you are bound to find something of use. Temok has been successful in ticking the right boxes. You can further find more information at Bluehost hosting plan.